Old map by DAUMONT - 6e Vüe d'Optique Représentant Le Chœur de la Cathedrale de St. Paul de Londres. Title: 6e Vüe d'Optique Représentant Le Chœur de la Cathedrale de St. Paul de Londres. Size: 10.9 x 16.2 inches. Condition: A fine copy. Some paint smudge on the title. Very good condition, dark impression. 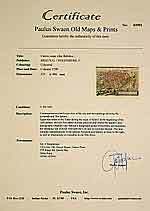 As a result of their constant handling, optical prints - as here - in pristine condition are extremely rare. 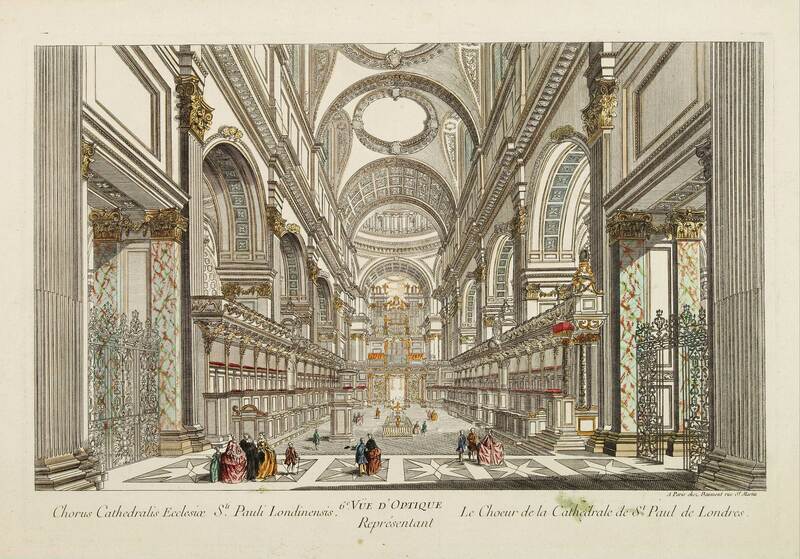 So-called optical print illustrating a perspective view of the interior of the Saint Paul Cathedral in London. In the eighteenth and nineteenth centuries there were many popular speciality establishments in Paris, Augsburg and London which produced optical viewing devices and special engravings to be viewed through them. In the 18th century the optical print or vue optique came into existence, whose exaggerated converging lines were intended to produce the optical illusion of deep recession. The viewing devices for which these perspective prints were produced consisted of a lens and a mirror, this requiring the use of reversed or mirror-image pictures. See our special page about optical prints and peep shows.